Albert "Shrimp" Burns became one of the most popular motorcycle racers in the early 20th century for hurtling himself with abandon around board tracks nicknamed "murderdromes." Here is his daring 1921 Beverly HIlls victory on an Indian captured on film. By the time he arrived at the Beverly HIlls Speedway in April 1921, the 22-year-old Burns had a reputation for daring racing. Growing up in Oakland, Calif., Burns was known to steal motorcycles at the age of 10; just shy of his 15th birthday, he beat several pro riders in a race, getting himself barred for a couple of competitions and earning the nickname "Shrimp." 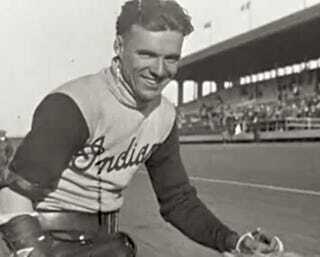 At 19, Burns had been successful racing for the Harley-Davidson factory team, but jumped at a chance to be the star of the show with the rival Indian factory team in 1920, setting world speed records at several races. The Beverly Hills Speedway, built in 1919, used 2x4s as a track surface. Board track racing for both cars and motorcycles had become popular because tracks were cheap to build, and the turns could be banked like velodromes to build up speed; a few tracks eventually sported insane 60-degree turns. Burns won the 50-mile race of the day, but crashed on the 25-mile followup at 107 mph, filling his hands and arms with splinters. For the final race, Burns borrowed a teammate's Indian and took back to the track wrapped in bandages. Riding behind the leaders for most of the race, he used the high banks to gather enough speed to pass on the final lap, winning with a speed of 102 mph. Four months later, Burns would crash at a dirt trace in Toledo, with his fiancée watching from the grandstand. The wreck broke his neck, and Burns never regained consciousness. His superb grit, coupled with the battling instinct, made him the greatest motorcycle rider of the present age. His record will stand on its own merits, for he was never known to quit as long as he had a motor left under him. Times without number he has fought single-handed against the field, sometimes winning, sometimes bested, but always fighting, fighting until the checkered flag fell and then always game to come back and try again.